First of all, I have to say a big thank you, to everyone who downloaded this mod and a even bigger thank you, to the one who gave me usefuk feedback. But back to the update: It's a rather small one and contains support for the current MC version (1.31) along with some improvements. I updated the stone texture, as there was some bad critic about it. I also fixed a bug, where you could see stripes on some textures. 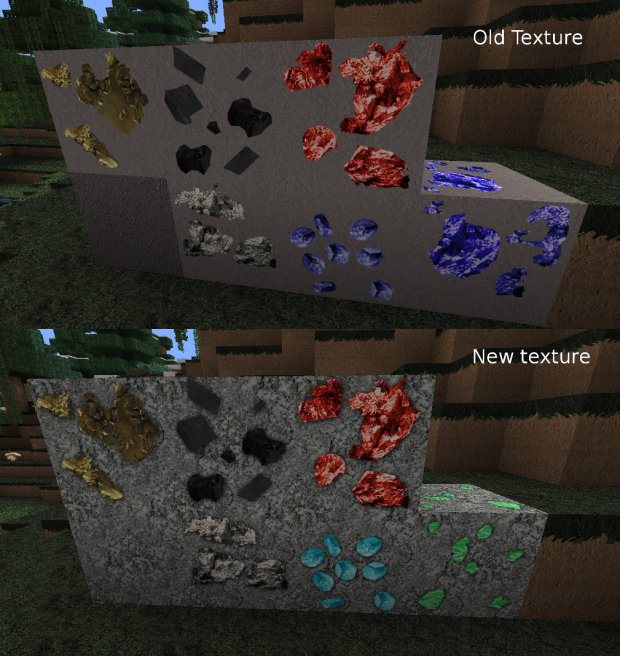 This texture pack is fully compatible with MC version 1.32. You don't need to re-download it, if you already got version 1.51 of my texture pack. The only thing you need to do is re-run the MC-Patcher. Otherwise, you could get heavy errors and crashes! New video stuff for you, my Minecraft-addicted friends! Showing my texture pack with 2 new trailers. Finally you can see it in motion! Version 2.0 is on it's way, with a heavy load of updates & and new Logo. Also, I added a new video. But if I use your pack with v1.3.2 it gives me lots of artifacts and strange things, is it just me? Could you please send me a screenshot? Because V. 1.32 runs fine for me. 1.31 is out. the newest Minecraft version. ????? can this still be used? Thanks for the Info, I'm gonna change it rightaway and handle in the new version in a few days. Yes, you can still use it, but some of the new textures might render incorrect. what isname of this music? It's in the video Description.